The #MongoDBSummer17 Interns have been able to work on some pretty amazing projects this intern season. Whether they were writing code to enhance user experience across the globe, preparing our newest backend as a service, MongoDB Stitch, for launch, or creating e-learning platforms for students to learn computer science in a new way, they have had an immense impact on both the product and the community. Computer Science For All (CS4All) is an initiative intended to further implement and apply computer science education to all of the New York City’s public schools. The program is built on the understanding that early exposure will help revolutionize the way students think about and understand CS, as well as increase interest amongst diverse groups because many students either lack access to CS or gain it too late. Nathan Dalal and Jordan Stapinski are two of our interns this summer who were able to work on the initiative. Nathan is entering his junior year at Stanford while Jordan will be starting his senior year at Carnegie Mellon in the fall. I had the opportunity to sit down with them to discuss their role within CS4All. Andrea Dooley: How and where were you first introduced to CS? Jordan Stapinski: In my senior year of highschool I took an elective which covered very basic computer science and programming. It was by no means technical, but it made me interested in computer programming, which prompted me to pursue it in college. Nathan Dalal: I took an advanced CS class in the 10th grade. My teacher was awesome and really excited about all things computer science. Once I got the hang of computers and coding I had a lot of fun with it. AD: How did you come to find the MongoDB Internship Program? JS: I had used MongoDB while experimenting with different databases. I was curious to see what was different about it because at the time I was using a lot of MySQL. Then the Campus Team came to a Carnegie Mellon career fair with Carnegie Mellon alumni and we had good conversations. Aside from what I knew about the product, the opportunity seemed really interesting. ND: MongoDB came to a Stanford career fair. I was familiar with the company because my previous internship used MongoDB as their primary database. I had never queried a database before that internship, but I found it to be super powerful. I thought it would be really cool to work at MongoDB and work on something that a ton of people use and will continue to use. AD: Tell me about the team you’re working on and how you became involved with the Computer Science For All initiative? ND: Jordan and I were placed on the Education Team, which is sort of an atypical but vital part of the business. They manage documentation and education courseware for MongoDB in order to help developers become more acquainted with MongoDB, understand best practices, and become familiar with new features and updates. JS: The Computer Science For All initiative works with partners across the city to help foster implementation and growth of Computer Science programs in all NYC public schools. MongoDB is one of those partners, specifically the Education Team because they really know how to teach – it comes with the territory. Nathan and I have been working on creating interactive lessons that help to demonstrate and explain basic CS skills for teachers to add to their curriculum for this coming school year. AD: That sounds like an amazing project and a huge undertaking. What kind of lessons did you create and how did you build out a plan to create them? JS: We first looked through the NYC high school curriculum. There is a scope and sequence of topics for each grade every month so we looked for areas of opportunity for what would be most interesting and relevant. I found Social Studies to be particularly interesting because one of the topics was the evolution of communication amongst groups over time, which also covered cryptography. I built an Enigma unit which included Caesar Shift, Vigenere Cipher, and the Enigma Machine encryptions. All are algorithm-based and help to teach basic principles of CS such as pattern matching. ND: I took a mathematical approach by leveraging mean, median, and mode, which are fundamental in CS by means of summing and sorting lists, and counting elements. The lesson integrates what these concepts are and how you would go about coding them. The lessons incorporate real data by determining the mean, median, and mode of the weather forecast of any city in the world, and also of the age, height, and weight of basketball players on any given team in the NBA. AD: Those are really out of the box approaches for introducing Computer Science to students. How will they be implemented into the curriculum? ND: In the first two weeks of our internship we went through technical training which included MongoDB courses, so we were able to get a good understanding as to how to distribute our units. We want teachers to have access to the right resources to understand how to use these units in their classroom and why they are relevant and important instead of just throwing technology at them. The lessons are not teaching CS per se, but they are teaching the topics and skillsets necessary to have a better understanding of logic and how computers work, as well as how to write code and understand it. JS: We are leveraging CS4all.NYC to distribute the lessons and unit documentation to explain which grade levels and standards each lesson targets and how students can benefit. The documentation will also help teachers with user experience and get all they can out of each lesson before sharing it in the classroom. We had students work through the units to test and they were able to provide great feedback for changes we should make. They had a great time working on it and said they would love having this type of lesson as part of their curriculum. That was probably my proudest moment. AD: This project is very different than what other interns are working on. How did you get involved? ND: I’m working on completing my minor in education so the Education Team was my first choice for my internship. The public education project and the internship program itself exceeded my expectations entirely. I’ve always wanted to work with public education and it was awesome that I found this project at MongoDB. I would not expect a database company to focus on improvements for CS education, but that is the spirit of MongoDB. They find the time and the resources to work on these types of cool projects and have a lot of impact, plus I personally have been able to learn a lot by building the unit. JS: The Education Team was also my first choice. I’m a Teaching Assistant at Carnegie Mellon, with a passion for education. I saw this project as an amazing opportunity for me to make an impact on the community, students, and ultimately the future of computer science education in New York City. When I was in high school, computer science was not tied into anything other than the designated courses. The thought of trying to find ways to tie it in for more exposure and engagement sounded really interesting. AD: What has been your biggest takeaway either from the project or the internship overall? JS: The experience for me has been one giant “Think Big, Go Far” moment. MongoDB is at a place where people are working on projects that matter to society as well as the business. They have a true passion for the work they do, and are so excited about what they’re doing that it rubs off. Everyone is happy to be here, which has helped to push me forward. This project helped to solidify that I want to move forward with a masters program. I’d say it’s helped me to realize the path I want to take. ND: From the way the recruiters talked about the program and the opportunity, to the people who interviewed me, you could tell MongoDB is a technically strong company and regardless of what I was working on I was able to grow a lot. There are dimensions to your work – you’re not just coding all day and completing an assignment and going home. People really care about the way you develop on your own. I wanted to be where i knew my work would matter, and this project has certainly fulfilled that. The intern events have been awesome, from Aladdin on Broadway to bowling to Escape the Room – it’s been really great to interact with everyone and spend time together outside of the office. I’ve been able to build relationships with a lot of super smart people. 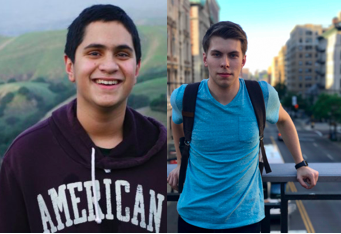 We’re very proud of Nathan and Jordan and the work they did to help students across New York City become more actively involved in computer science. Their project is a giant step in the right direction to help increase interest in CS careers and bridge the gap in diversity forever. Our summer program is coming to an end but we will be accepting resumes for next summer very soon! To learn more about the MongoDB Internship Program, click here.